Students offer policy recommendations to combat continued issues of drug trafficking and cartel violence. "I lived in Matamoros, Tamaulipas, for most of my life. While growing up there, I witnessed the growing cartel violence and, unfortunately, some family and friends were directly affected by it," said Master of Global Policy Studies student Sara Garcia. For Garcia, Mexico's security challenges are personal, and she knew she wanted to work toward decreasing the violence upending lives in the country. It was that desire that led her to LBJ, and when she discovered a policy research project (PRP) directly devoted to examining related issues, she jumped right in. Yearlong policy research projects provide students with an opportunity to holistically examine a real-world policy problem for a specific client. The course was sponsored and fully funded by the Mexico Security Initiative program of the Robert Strauss Center for International Security and Law, an interdisciplinary research center affiliated with the LBJ School. The final product of the course was briefed to the Consul General of Mexico in Austin, Ambassador Carlos Gonzalez Gutierrez. "The purpose of this PRP is to get students to think comprehensively about Mexican security policy, to evaluate current policies and to think critically about ways that they could be improved in the future. These security challenges don’t just stop at the U.S.-Mexico border and require cross-border understanding and cooperation in order to move toward better solutions. 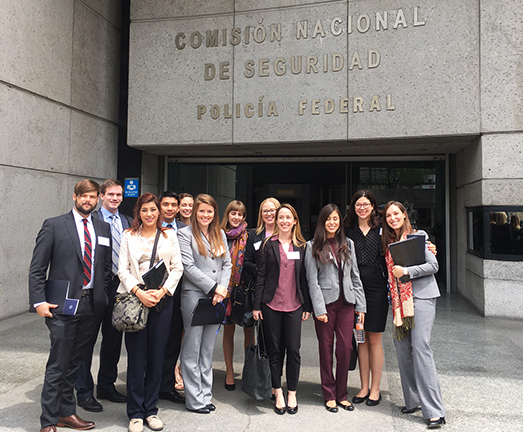 The PRP's students played a role in thinking through these security issues and coming up with concrete and actionable policy improvements,” said course co-instructor Stephanie Leutert, Mexico Security Initiative Fellow at the Strauss Center. The first semester of the project focused on researching all different aspects of Mexico's organized crime challenges. Through lectures and readings, students built a foundation of knowledge around organized crime, cartel violence and economics, Mexico's government institutions, and the country's current policy responses aimed at stemming the numerous security challenges caused by drug trafficking. Guest speakers, another critical piece of providing students that foundational knowledge, included security experts such as Mexican journalist Alejandro Hope, Latin American national security expert Ana Maria Salazar, former U.S. Ambassador to Mexico Antonio Garza and Ambassador Carlos Gonzalez Gutierrez, Consul General of Mexico in Austin. In addition, the course tapped into faculty expertise across the university in political science, journalism, Latin American studies, law and more. Then, in March, the Strauss Center supported a student trip to Mexico City to get on-the-ground perspectives from professionals who focus on the country’s security issues and who are the architects or analysts of the Mexican government's policies. The students' packed schedules included visits with members of Mexico's National Security Commission, the Mexican Federal Police, the U.S. Embassy in Mexico and the Mexican Senate. "Our team held a number of pretty high level meetings: with the Federal Police Commissioner, the U.S. Ambassador and her entire team, academics, journalists and other government folks," said MGPS student Scott Squires. In addition, students were required to set up and conduct individual interviews relevant to their particular areas of research. “"Some students came back from these interviews thinking completely differently about their proposed recommendations," said Leutert. "As an instructor, that's one of the most exciting things to watch — that learning experience of taking your ideas out into the field and having them be adjusted. It's valuable to learn at any stage, but particularly for policy students thinking creatively about some of our region’s most complex security challenges." Students were also fortunate to have dinner with international journalists from Bloomberg, Financial Times, Buzzfeed and the Wall Street Journal who cover security in Mexico. "As a journalist and someone who wants to pursue a career in foreign policy and international reporting, my research aligned perfectly with my career goals," said Squires. "I definitely made some connections that will benefit me in the long run." Two students even landed internships as a result of their PRP participation. "Through the networking this project provided, I was able to get an internship as an advisor with the Comision Nacional de Seguridad, which will provide me with invaluable experience for my future career," said Garcia. Read more about the students' trip to Mexico. At the conclusion of every PRP, students provide policy recommendations through both an extensive written report and a presentation. The projects are an opportunity to take coursework out of the classroom and into action. "My future career plans include living in Mexico and working for either a university or think tank on the topic of Mexican security," said MGPS student Caitlyn Yates. "I definitely have a more holistic understanding of security after this year. From the historical context to the stakeholders on this topic, I understand the larger picture and realize how much more I need to learn." Through a rigorous core program, hands-on application and options for customization, the Master of Global Policy Studies degree provides students with an interdisciplinary understanding of global policy issues. Graduates are prepared for careers in sectors like national security and intelligence, international development, global governance, energy and global environmental policy.